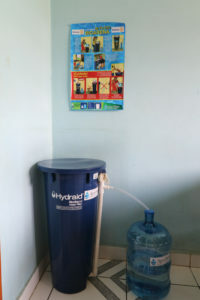 One filter in the maternity house (pictured right), where pregnant women, who live far away from the clinic, stay when they are close to their due date. 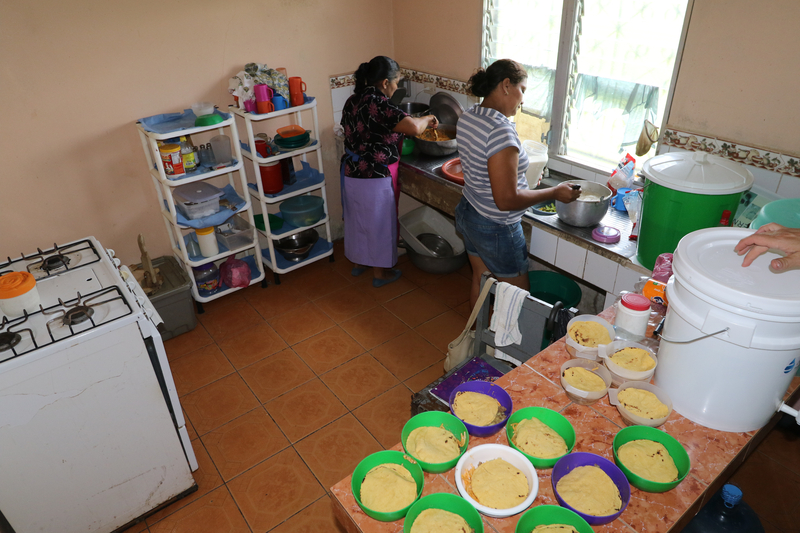 And, Amigos de las Americas Lunch Program, a “soup kitchen” that feeds malnourished children. Amigos de las Americas is a US-based nonprofit organization that provides medical attention to underserved people. They organize medical brigades periodically and have teams of nurses and health promotors who attend to communities and monitor their evolution. They also have a donor sponsorship program to help with the daily challenges of the most underserved children. Supported by the sponsorship program, Amigos de las Americas opened its “Soup Kitchen” in downtown Trojes more than twenty years ago. Here is how it works…Parents who want their children to benefit from the program must first bring the children to the doctor. If the child is diagnosed as malnourished, the child is accepted into the program. When a child reaches 9-years of age, he/she must go to the doctor again. Those who are still malnourished continue with the program. 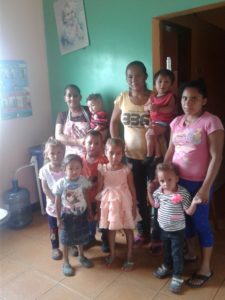 While the child is in the program, Amigos de las Americas gets to know the family and their needs. Using this information, they work to help them get support, as needed, through the sponsorship program. These children are in a critical situation. Because they are malnourished, they are more susceptible to illnesses, including waterborne diseases. Diarrhea kills upwards of 800,000 children every year and is the second leading cause of death among children under the age of 5. Malnourished children are the most at-risk of suffering from life-threatening diarrhea. They need special attention. 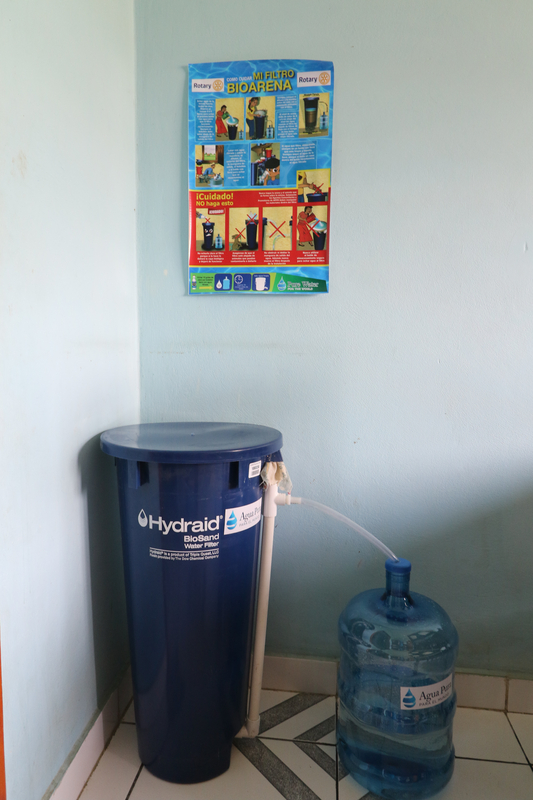 In support of their effort to improve the health and future for these children in Trojes, PWW installed a safe water filter, enabling the staff and volunteers to improve their kitchen processes while eliminating the expense of paying for water. It is nine o’clock in the morning, one hour before people start coming. 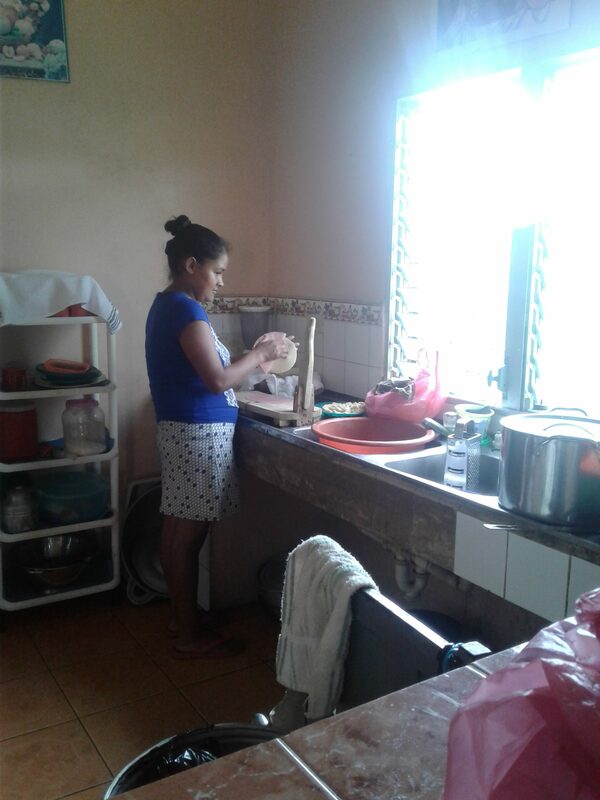 Angela Rosales Sosa comes into the Kitchen, as she has done every morning for more than twenty years. Today, she is carrying a full load of groceries, so she has all of the ingredients needed to cook the meal for every child who will come. Angela loves her job. The children give her the focus and drive to remain committed to her work. One hour later, at 10am, Angela opens the gates to the Kitchen. It is time for people to come. Delsi Martinez is the first to arrive with her 10-month old daughter, María Alejandra Guillén. Delsi is also a chef, though she is not able to work at the moment. She has been bringing María Alejandra to the kitchen for the last month. Delsi also brings her nephew, Victor Moises, who has three siblings (two sisters and one brother) between the ages of five and eight years. Victor likes to play hide-and-seek. Delsi’s husband cannot come with her because he is working in the fields, but she is in very good company. José Arjona León, another nephew of Delsi, is with her to help with the little ones. Like most other 10-year olds, he loves to play “Wolf” – a Hondurian version of Tag in which one player, the wolf, has to catch the others (who play sheep). His favorite subject in school is Math. José’s mom left when he was little, and his dad is struggling to find a job to sustain his family. They live with Victor Moises’ grandmother who, apart from being an excellent housewife, runs a coffee business. Angela greets the family and heads back to the pots and pans. She is worried about those kids. She hopes Doña Lilian, manager of Amigos de las Americas in Trojes, can find someone to sponsor them. Sponsored children can keep coming to the Kitchen even when they are older than nine. They can access, not only food, but also free medical care, as well as school material and uniforms. They would be safe. The next to come into the Kitchen is Sarai Alexander with two of her beautiful daughters, Yamin Xeimi and Alma Rosa, as well as Jose Antonio, a 10-month old toddler. Sarai and her husband, Eric (a butcher), have two older children. Joviani and Anabés are nine and twelve, so they are too old to come to the Kitchen. Angela is really glad to see Yamin Xeimi and Alma Rosa in the Kitchen today again. Yamin Xeimi, who is 7-years old, likes to spend her free time painting and helping her mother with the house duties. When you ask Alma Rosa, Yamin’s little sister, what she likes to do, she also says that she loves to paint and help out. But, we quickly learn the truth is that Alma Rosa looks up the her older sister and just wants to spend time with her. The food is almost ready. Angela is doing an amazing job with it, especially given the circumstances. Food for the Kitchen used to come canned from the US, as well as corn, beans and rice sacks. Today, Angela only has whatever she can find on the local market and she has very limited funds. She squeezes every drop of imagination to provide these children with the best food she can. Right before they start to eat, Nuris Marallaga enters the Kitchen with her children, Deisi Carolina and Yerri Balvino Escobar. 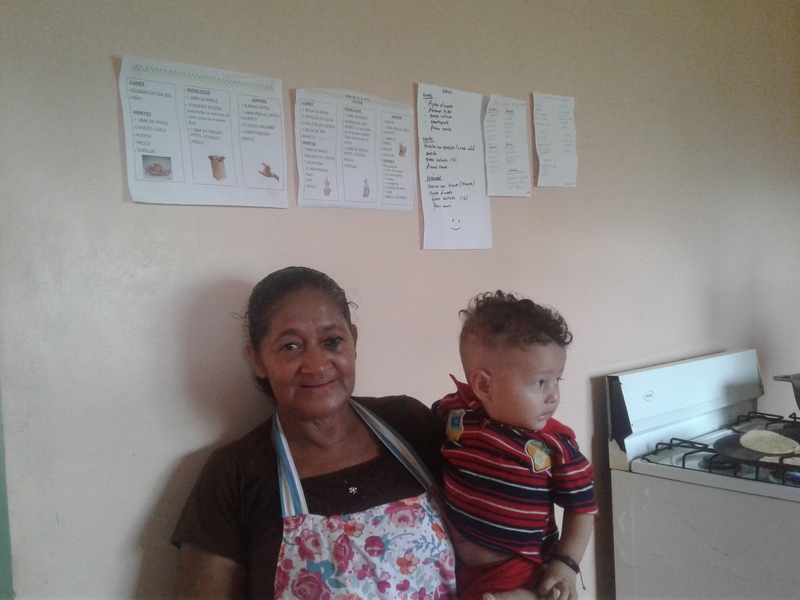 Yerri is only 7-months old, but this family has been coming to the Kitchen for two years, when Deisi Carolina was only one year old. Angela smiles when she sees them. She feels great to see so many people at the Kitchen today. Angela is grateful to Pure Water for the World. Before the installation of their filter, water had to be purchased every day. Thanks to the new filter, Angela can cook and clean with water that is safe. And, with reliable access to clean water, Angela can use the money saved to do an even better job of feeding these precious children. WASH Success Stories Beneficiary Stories, Community, Honduras, PWW Volunteers, Success Stories. permalink.